In the past week we’ve done a bit of rearranging in our apartment. I’m rather pleased about it. It helps make our place feel more spacious and practical. You may remember sort of what our dining / kitchen area looked like before. We had added the cabinet as an extra prep area but it was often cluttered, and always played home to my mixer. It’s now found a new spot right under the window. I’m especially excited about actually getting to use some natural light in some of my photos (hopefully at some point, as if I’m ever able to take photos any other time than late at night). 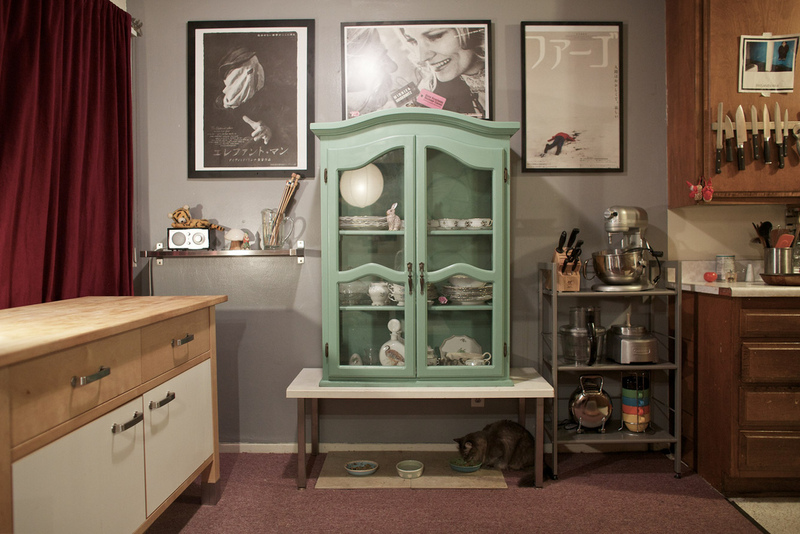 The space is much more open and I love that it features our china cabinet. We have lovely heirloom china from Shawn’s mom and I can’t wait to display it even more prominently. It’s so beautiful. Not to mention our china cabinet itself is pretty awesome. We actually found it on the street and salvaged it. With some cleaning and paint, it was exactly what we wanted. We’ve also moved our kitchen table to a more central position in our living room. This is great because it allows for more seating, whereas before it was against the wall and could only seat 3. We added a big bench on one side which definitely draws guests into sitting at the table. Since the table doubles as a work space for me, the move is also great since I can now be in the living room when I’m crafting or sewing. No longer shall I be cast out when working on projects. Equally awesome is that I can now watch movies while I work. Sweet! We got some new mounts for a couple of our bikes. I love how they look and they take up much less space on the wall than the way they were hung before. We have a bed in our living room, even though we have a bedroom with a bed as well. It’s a little odd, but it always comes in handy for our sleepover movie parties or when visitors are staying with us (which happens fairly often). Now it is sectioned off a bit more by the couch so it doesn’t feel like you’re in a bedroom when you’re just hanging out. The leopard couch will probably be going in storage for a little bit, but the cats are awfully fond of it (as am I) so we’ll see. I’m so happy with how everything feels, just by making some simple changes. Hope you enjoyed the mini tour of our apartment. I realized while writing this that there aren’t many photos of it online. cool!!! 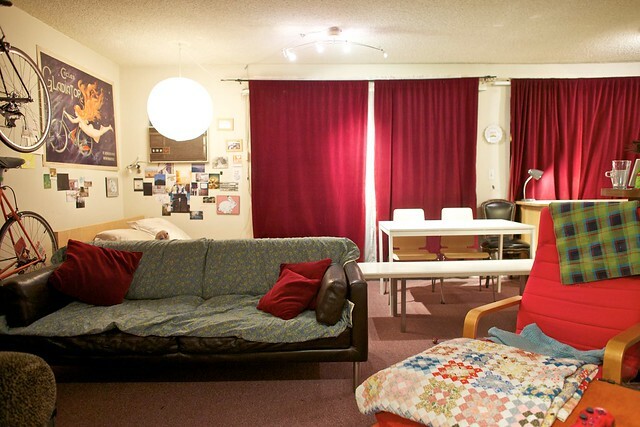 i’ve been actually wondering what my friends’ apartments look like. i have been cleaning mine all week. gotten rid of 3 huge loads of stuff we don’t need anymore. i can now get dressed in my walk in closet and it’s so organized i feel so happy. last night i organized our bike parts bin. 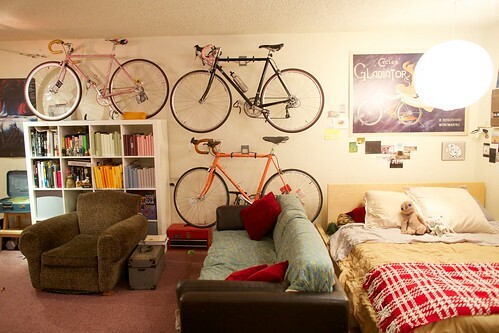 and having 6 bikes in the corner of the apt isn’t easy but the stand we have helps. 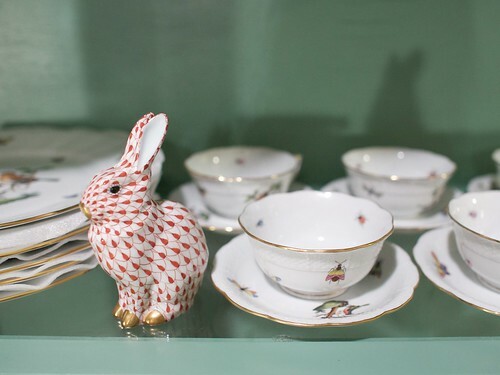 last task: our kitchen… happy 2011. your place is cute and the china is def beautiful! Your apartment is absolutely the cutest thing ever. My apartment looks like the cell block of some once rebellious pamphleteer caught trying to expatriate some dismal eastern block country for greener pastures. 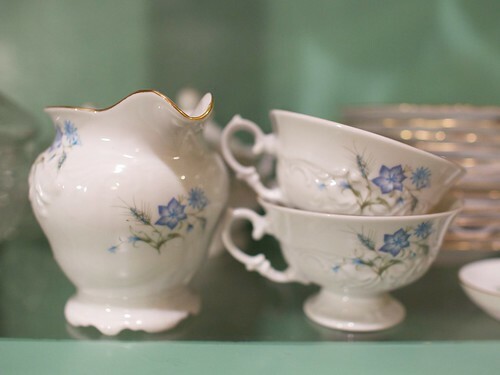 i am in love with your china – so sweet. and the color of your china cabinet looks good enough to eat. the pieced quilt in front of your red chair is also very charming.